Along with books on grammar, writing and the English language you will find Empire of Illusion: The End of Literacy and The Triumph of Spectacle by Chris Hedges on the shelves at your local branch of the Fraser Valley Regional Library system. Mr. Hedges argues that we now live in two societies: One, the minority, functions in a print-based, literate world, that can cope with complexity and can separate illusion from truth. The other, a growing majority, is retreating from a reality-based world into one of false certainty, magic and wilful denial. One would have thought that as part of due diligence in hiring Mr. Scott Hargrove as the CEO of the Fraser Valley Regional Library, those responsible would have ensured that Mr. Hargrove had more than a rudimentary grasp of the English language. Perhaps they simply assumed that with a library career that spans 23 years Mr. Hargrove had a command of the English language appropriate for the head of the FVRL. Which would be a reasonable assumption were it not for the state of non-education, illiteracy and functional illiteracy in our increasing misnamed education system. Indeed, it is the state of non-education, illiteracy and functional illiteracy in schools today that has forced universities to provide remedial upgrading and that requires community leadership from our libraries on literacy. In light of the increasing loss of nuance in the use of the English language, part of providing community leadership on literacy is being picky about grammar and usage. After all, it is somewhat difficult to provide community leadership on literacy when you are sloppy in your own use of language. Canada Day Hours of Operation – Closed. From the Longman Dictionary of Contemporary English Operation: the state of being operative. Operative: engaged in, concerned with or pertaining to work or productive activity. In other words operation is the state of being engaged in work. To be engaged in work you must be open. It follows that if you are closed you are not engaged in work, are not in the state of being operative, are NOT in operation. 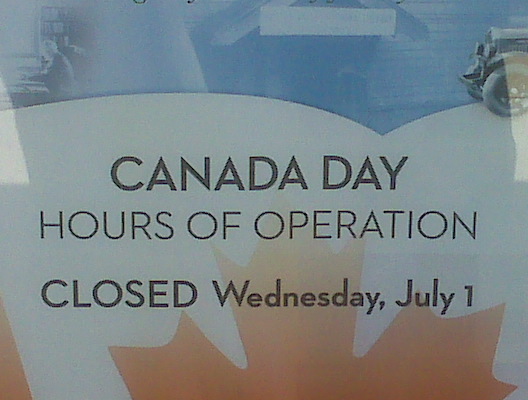 Therefore on Canada Day the word operation is not applicable. On BC Day – Monday August the 3rd 2015 – the FVRL is closed, is non-operative and the word operation is not applicable. 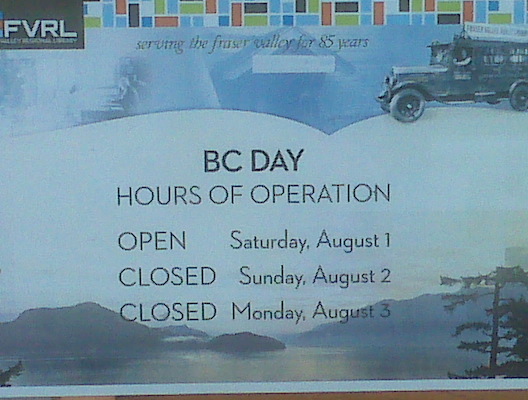 As the sign specifically addresses the BC holiday ‘hours of operation’ and both Saturday August 1 and Sunday August 2 are NOT BC Day they should not be on a sign specifically designated as about the BC Day Hours of Operation. As an aside please note that while Hours of Operation do apply to Saturday August 1 because the library will be operative, Hours of Operation does not apply to Sunday August 2 as the library is non-operative that day. I have no idea why the head office, the home turf of Mr. O’Brennan, insists on sending out notices about Library closures as a result of holidays using the officialese ‘Hours of Operation’ instead of the simpler and far more flexible Holiday Hours. I also readily admit that few, if any, understand why this point annoys me so. But in gifting me with a love of reading [and libraries] my parents gifted me with a love of language. And it is acutely painful to be forced to regularly endure the FVRL contributing to the triumph of spectacle and the end of literacy.